A sneak peek into what’s in store for TalQuest ‘19! Time to hire has always been the most critical of hiring metrics. Apart from the opportunity, the cost of not having someone on the payroll can affect other hiring metrics such as quality of hire (best candidates are only available for 10 days), cost of hire (long time spent by recruiters and hiring managers due to long process) and candidate experience (long wait time is number one candidate reason for poor experience). Imagine spending two months to hire a candidate whose expertise is only required for 6 months. That's what we're aiming to transform. 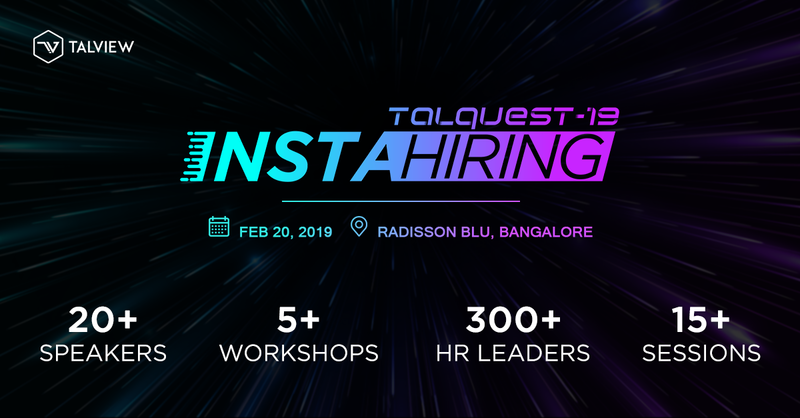 Say hello to Insta-Hiring at TalQuest 2019- a revolutionary hiring idea that is set to take the recruitment world by storm.The third edition of TalQuest is set to be bigger and better than all its predecessors and we can’t wait to witness the excitement live! To enthuse our fellow HR peers in the industry, we have planned Masterclass sessions, certification workshops and thought leadership sessions, all in partnership with the best minds in the industry. Insta-Hiring is a collective solution to all problems relating to time to hire. We, at Talview, empathize with the everyday problems of the recruiter and strive to innovate simplified technology to be closer to the candidate. We have thus curated the opinions of pioneers in the industry to culminate the idea of Insta-Hiring- the fastest way to hire a candidate. Why should I attend TalQuest 2019? TalQuest 2019 is intended to bring in the wave of change in the recruitment industry. Attendees will be equipped with the know-how of technologically superior HR tools to accelerate their hiring. TalQuest will draw in the attention of HR enthusiasts across different job roles across the world. We aim to provide our attendees with the knowledge, tools and best practices to come out on top at the hiring game! The first leg of TalQuest is completely devoted to Masterclass sessions and certification workshops conducted by experts in their respective fields. The first leg is intended to train HR managers to aggressively prepare for the dynamic industry that is fast approaching. These workshops are intended to nurture healthy learning between the trainer and the trainee about the nuances behind Insta-Hiring. In short, at the end of the session, the attendee will gain insightful information and tactical tips on how to hire instantly. What’s more? Attend the Masterclasses and get certified as a future-ready Insta Hiring Expert! The second leg of TalQuest is intended for business leaders who are looking to step up their game with quick recruitment. A good organization is characterized by its ability to devote minimal time to redundancy and maintain efficiency consistently. The second leg of the day will be graced by top speakers from various parallels across the recruitment industry. Sign off the day with an engaging session from a prominent non-industry personality. we get closer to the big day, we plan to reveal the exclusive sessions that we have planned for the day. Here’s a sneak peek into the Masterclass sessions at TalQuest 2019! Integrating Video Interviews and Artificial Intelligence to create a technologically superior tool for fast, cost-efficient interviewing. Using bots to enable insta-hiring- Speed up your hiring process with minimal human intervention with intelligent bots for recruitment. Omniscient processing in Insta-Hiring: The key to hiring instantly, anytime, anywhere. These are just 5 sessions of 20+ sessions that we have scheduled for big day. All sessions and certification workshops are conducted in partnership with the best industry speakers, HR leaders and hiring pioneers from Fortune 500 organizations. Keep an eye out for some of the best real-time examples of large companies that were brave enough to make the leap. HR managers or professionals with equivalent designations are eligible for the HR Trailblazer program. Each participant will be trained on the best practices and tools in Insta-Hiring by experts and prominent speakers from the field. The participant will be required to curate the best hiring strategies aligning INSTA-HIRING, after attending TalQuest. The top 25 strategies/ HRs will be chosen for the Trailblazers program by the jury. Post-TalQuest, the participant will continue to be trained on Insta-Hiring via special sessions from distinguished experts for a period of 2 months. The final test will be conducted in March, where the winner will be provided with an opportunity to speak and network with peers at FLASH, an exclusive HR event by TalQuest that will feature HR pioneers and leaders! If the participant registers for the program at TalQuest, s/he will be liable to take up the program FREE OF COST. However, participants registering after TalQuest will be liable to pay a fee to enter the competition. The HR Trailblazer program will offer immense exposure and networking opportunities with top leaders in the hiring industry. With HR Trailblazer, not only will you be professionally trained to become an insta-hiring expert at no cost, but you will also be paving a new road to bringing more awareness to cope up with the pace of work. So, bring in your peers and buckle up for the future of hiring! If you haven't registered for the event, make sure to save your seat soon here! We’ll see you next time with more exciting updates that’ll keep you at the edge of your seat. P.S: Bringing your team along? We have exciting offers for bulk registrations. Get in touch with at events@talview.com to know more!